I get this question on a weekly basis: When should I start brushing my little one’s teeth. Well…as some of you may be aware The American Academy of Pediatric Dentists (AAP) recently issued new recommendation on this topic. All children should start brushing with toothpaste containing fluoride as soon as their first tooth appears. 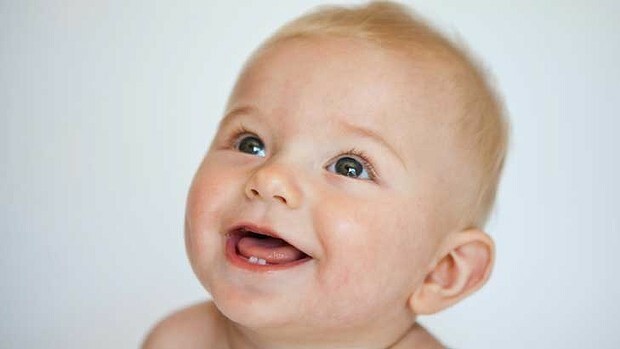 This is typically the two middle teeth in the lower jaw, around 6 months of age – as seen in the picture above. The AAP does advise to use just a small amount of toothpaste, about a grain of rice for children under 3 years and a pea-sized amount for children older than 3. Over the counter fluoride rinses are not recommended for children under 6 years old, due to a risk of swallowing higher than the recommended amount. You can find the actual article on this topic: “Fluoride use in caries prevention in primary care setting” Journal of Pediatrics, vol 134, No 3, September 2014.